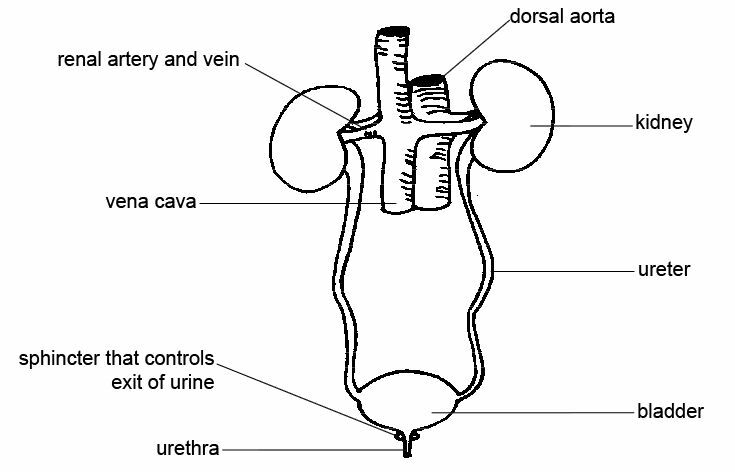 The kidneys in mammals are bean-shaped organs that lie in the abdominal cavity attached to the dorsal wall on either side of the spine (see diagram 12.2). An artery from the dorsal aorta called the renal artery supplies blood to them and the renal vein drains them. To the naked eye kidneys seem simple enough organs. They are covered by a fibrous coat or capsule and if cut in half lengthways (longitudinally) two distinct regions can be seen - an inner region or medulla and the outer cortex. A cavity within the kidney called the pelviscollects the urine and carries it to the ureter, which connects with the bladder where the urine is stored temporarily. Rings of muscle (sphincters) control the release of urine from the bladder and the urine leaves the body through the urethra (see diagrams 12.3 and 12.4).